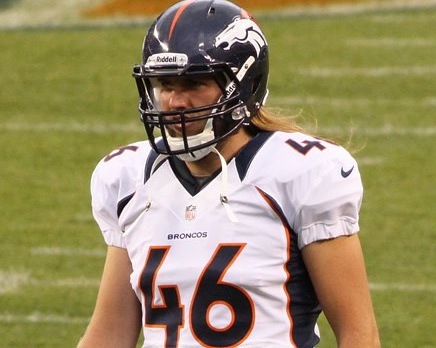 Rookie long snapper Aaron Brewer has been solid for the Broncos all season, just like he was in his four seasons (2008-2011) at San Diego State. In the Monday night game, the Broncos scored 35 unanswered points and beat the Chargers, 35-24. Brewer snapped the ball well and was efficient in protection, and continues to prove that the Broncos made the right move by signing him over the pricey veteran snapper they had last season. Brown remains out recovering from a broken ankle suffered in the preseason. In a recent update on Rotoworld, it was reported that Norv Turner said Brown was “right on schedule”. He is eligible to return to practice in Week 7. The Raiders missed their chance at being the first team to knock off the undefeated Falcons, losing on a last-second field goal, 23-20. Burris had 4 total tackles in the game, including a key stop on the goal line when he prevented running back Michael Turner from scoring. The drive eventually ended with the Falcons settling for a field goal from the 2-yard line. Burris has 18 total tackles this season. Like Brown, Dombrowski remains on the injured-reserve list with a foot injury. According to an article published by The North County Times, he is expected to return in Week 8. In a match-up that could very well exemplify the current shift of power occurring in the NFL, the up-and-coming Seahawks defeated the perennial powerhouse Patriots, 24-23. Farwell contributed two tackles in the game, giving him a total of seven on the season. In a bitter homecoming to his former stomping grounds, Hillman saw limited action in the Chargers loss to the Broncos at Qualcomm Stadium. He had just two carries for three yards, but remains the primary backup running back behind Willis McGahee. After starting 4-0, the Cardinals dropped their second straight, falling to the Bills in overtime, 19-16. Quarterback John Skelton was active for the first time since he suffered an ankle injury in Week 1, and entered the game when starter Kevin Kolb was knocked out with a rib injury late in the fourth quarter. With two injury-prone quarterbacks ahead of him, and Skelton struggling in his return (2-10, 45 yards, 1 INT), don’t be surprised if the Cardinals turn to Lindley at some point this season. The Morrison mystery continues, as he was inactive once again for the Bills in their win over the Cardinals. Unfortunately, there is still no clear reason as to why Morrison has yet to play this season. In another overtime thriller, the Lions defeated the Eagles, 26-23. Osgood, the special teams extraordinaire, had one tackle in the victory. In a battle of two former Pac-10 (or Pac-12) quarterbacks, Mark Sanchez outdueled Andrew Luck, and the Jets handled the Colts, 35-9. Schilens continued his consistent production, grabbing two catches for 23 yards. Did you miss the “Aztecs in the NFL: Week 5″ post? Check it out here!